Just as we are preparing for the final season of Game of Thrones, fans are busy picking their sides and choosing their candidates for the throne. Well, after watching this video, we are sure many will change their allegiances to Sansa Stark aka Sophie Turner. The actress knows how to have fun and recently as she attended the New York Rangers game on Tuesday at Madison Square Garden, she managed to entertain everyone by chugging a glass of wine. Sophie found herself on the massive JumboTron screens during the game and her reaction after waving to the fans was to chug the wine glass that she was holding. Not just this, the actress later even shared the same video on her Instagram and said, "Send it for the starks. "Game of Thrones Season 8: From Jon Snow To Daenerys Targaryen All Surviving Main Players And Where We Saw Them Last - View Pics! While Turner's fans were left amazed by this impromptu feat of her, her soon-to-be brother-in-law, Nick Jonas replied in the comments to the video, saying, "Oh my god." Sophie's beau, on the other hand, seems to know well how cool his fiance is and hence responded with a sunglasses emoji. 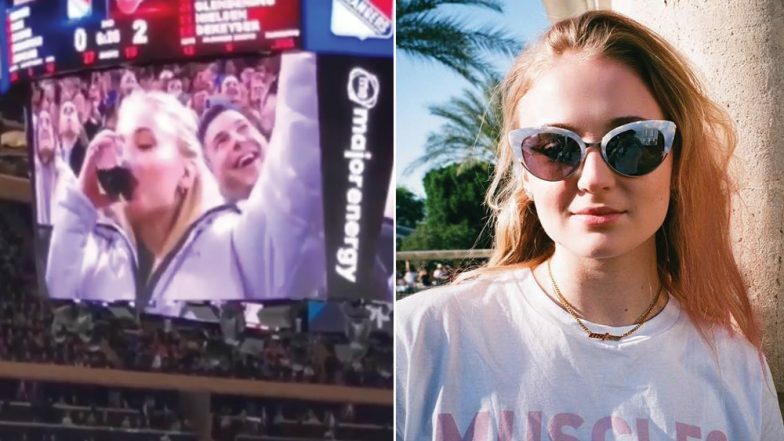 Sophie Turner And Joe Jonas Make Out At A Knicks Game And Remind Us Of Pete Davidson - Kate Beckinsale's Recent PDA Sesh! View Pic. Sophie Turner is all set to be seen in the final season of Game of Thrones which will start airing from April 14. The HBO series is now in its eighth season and has left fans waiting with bated breaths. On the film front, Sophie will be next seen in Dark Phoenix as Jean Grey. She will be reprising her role from X-Men: Apocalypse. The film is all set to release in June 2019.